Beautifully engraved uncancelled Gold Bond Certificate from the Chicago, Saginaw, and Canada Railroad Company issued in 1873. This historic document was printed by National Banknote Company and has an ornate border around it with a vignette of a logging camp. This item has the signatures of the Company's President and Secretary and is over 141 years old. 60 coupons attached on bottom. This type of bond was used in the recent infamous Gold Bond Scam. This scam involved the contention that the uncancelled bonds of some old, bankrupt railroad companies organized back in the 19th century were still today valuable. It also involves some Chinese Bonds including 1913 Chinese government issues. 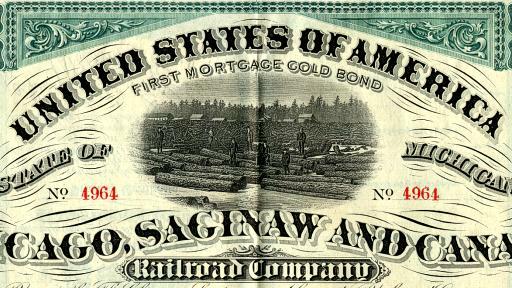 Investors have paid as much as $150,000 for the Chicago, Saginaw, and Canada Railroad Company bond as they were told that each Saginaw bond was worth approximately $91 million. 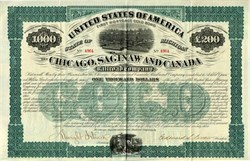 Unfortunatley for these unsespecting investors, the Chicago, Saginaw & Canada Railroad Co. filed for bankruptcy 122 years ago, and their bonds have value only as a collectible. They have no value as a redeemable security regardless whether or not they have been cancelled. The Commission announced today that it obtained a second federal court order prohibiting the fraudulent sale of bonds, purportedly backed by gold, issued in the 19th century by now defunct railroads. The emergency restraining order, issued March 9, 1998, by Judge Gary L. Taylor, prohibits Gerald A. Dobbins ( Dobbins ) and Fidelity Secured Deposit Corp. ( FSDC ) both of Orange County, California, from preparing and disseminating fraudulent authentication and valuation documents relating to bonds including those issued by the Chicago, Saginaw and Canada Railroad Co. (Saginaw) in 1873 and by the East Alabama & Cincinnati Railroad ( EA&C ) in 1870. According to the complaint, these bonds are worthless as investments, having value only as historical memorabilia, but have been offered and sold to investors at prices up to $40,000 each. Judge Taylor s order also included a freeze of assets and an accounting against Dobbins and FSDC. The Commission's complaint alleged that since at least October 1995, Dobbins, through FSDC, has prepared documents purporting to authenticate and value Saginaw and EA&C bonds stating, among other things, that the bonds were worth between $100 and $400 million, Dobbins was the Master Curator for the State and the Historical Document Society, and the bonds were valid or guaranteed by the State of Alabama. The complaint further alleged that in fact, the bonds were virtually worthless, Dobbins is not the master curator for any state, the Historical Document Society does not exist, and the issuers of the bonds had gone into receivership and several foreclosure sales had been held. The Commission alleged that through their false and misleading statements, Dobbins and FSDC violated the antifraud provisions, Section 17(a) of the Securities Act of 1933 and Section 10(b) of the Securities and Exchange Act of 1934 and Rule 10b-5 thereunder. This is the second civil injunctive action filed by the Commission s Central Regional Office in connection with the fraudulent offer and sale of Saginaw bonds. In the first action, the U.S. District Court for the District of Wyoming entered a preliminary injunction on February 13, 1998 including an asset freeze against defendant Daniel E. Schneider ( Schneider ) and related entities. The Commission s complaint alleged, among other things, that Schneider offered and sold Saginaw bonds to investors at $40,000 per bond through various misrepresentations, including that the bonds were worth $100 million. SEC v. Daniel E. Schneider et al., Civ. No. 98-CV-14-D (D. Wyo. Feb. 13, 1998). Various law enforcement agencies worked closely with the Commission in obtaining emergency relief, including the Securities Division of the Wyoming Secretary of State's Office, which the Commission wishes to thank for their assistance in this matter.